The Scream is a Corrs fan? Yeah, I think i'll build on that in future stories. 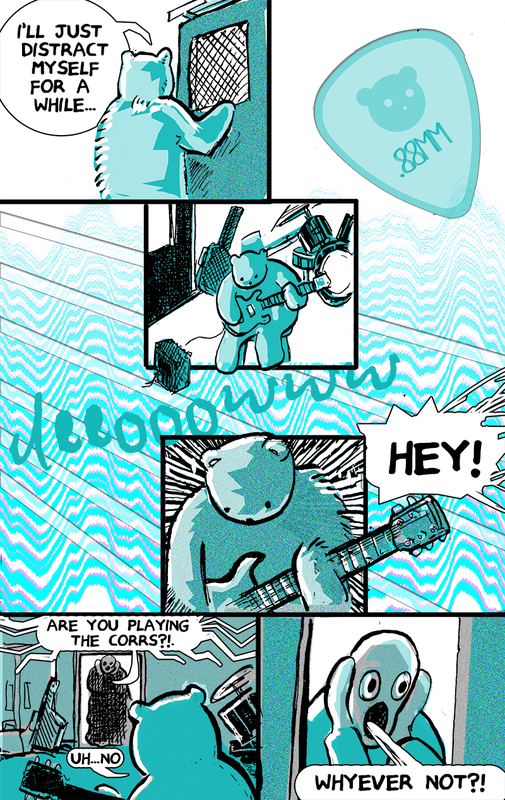 Barnabus Buggles appeared in an old comic playing guitar, so I felt like he should sneak away from the madness for a bit. Ah the bloody Corrs - not quite such inspirational lyrics there. I imagine the real scream would be listening to some Jamaican thrash metal. Myths - you cant go wrong with the myths - well done parents! I quite like the idea that The Scream goes home after a long stressful day at work, sits in a rocking chair, blasts some Corrs and screams along to their sweet Irish voices. I guess the rocking chair would need frequently replacing to. The Myths? Is that a jamaican thrash metal band? Totally realised that was a response to yesterdays response. Yes. Must get brain checked. Yeup yeup. Brocko goes for .50 max, so he can fake-shred. Though I dunno if he has the attention-span for instruments yet. Interestedly enough, Baby Seal was first created last summer as a plasticine figure, with a plasticine drum-kit and all. Also sorry for the crappy delay, I'll upload the next page later today!